Laura Dilloway has spilt many a bean about LittleBigPlanet PSP to us over the past week or so, and now we have a whole interview with her for all to enjoy. Read on to find out why you should be playing the all-new single-player, how the online aspects differ from the PlayStation 3 version, and what else the PSP can offer us. That VideoGame Blog (TVGB): What one aspect of LBP PSP are you the most proud of? Laura Dilloway: The PS3 game was awesome because it was so innovative. It took the deceptively simple concept of a cute, loveable character leaping and bounding his way around a beautifully detailed physics-based environment, and then allowed the player to not only customise their character but also to create anything that they had seen or that their imagination could possibly dream of and share it with all their friends. It is platform gaming as you have never seen it before. I think our biggest achievement is our fidelity to this concept. It was always going to be a massive task trying to make such a rich game as LBP fit onto the smaller PSP system, and yet we have done it. We have created a version of the game that stays true not only to the unique LBP universe but most importantly fulfils the entire Play Create Share philosophy, and that’s something that we’re immensely proud of. TVGB: We’ve talked about a lack of multiplayer before, and how it was a necessary sacrifice, but there are features that make up for this. Can you tell us a bit about them? Laura Dilloway: The key features of LBP are obviously Play, Create and Share – a story mode with instant and engaging playability, the ability to create your own levels, and the ability to share those levels with your friends and the rest of the community. We have made every effort to ensure that we have replicated these concepts on the PSP. I suppose you could call it a sacrifice, but even the Media Molecule team agree that “the sacrifices made were the right ones” and I think that we have ended up with the better LBP experience because of it. The biggest and most important of these features was Create mode, without which LBP simply would not be LBP. We have matched pretty much all of the functionality of the PS3 editor into the PSP version (with a few minor control changes) and even managed to include some new ideas that already players on our Beta trial have said are extremely useful. For example we have excluded the Dark Matter material from the game, because we allow you to specify whether a material is “static” or “dynamic”. If you set a piece of material to be static then you know it’s never going to move. This means you don’t have to keep pinning your levels up using blobs of Dark Matter – and they are less likely to come crashing to the floor if you unpause only to discover you forgot to pin them! TVGB: How does downloading and uploading levels work? Laura Dilloway: With the PSP you can choose when you want to go online, rather than the “always-on” nature of the PS3. To reflect this, we have a new feature called the Community Moon, instead of having the online features attached to the Story Moon as in the PS3 version, so our interface is slightly different. You can upload or “publish” up to 20 levels, as you can on the PS3. Downloading other players’ levels works a bit differently due of the portable nature of the PSP. As a result, when you download a level to play it is stored to your memory stick and you can carry it with you and play it anywhere – you don’t have to be online. The number of levels you can download is dependent on the size of your memory stick; the PSPgo has 16gb of storage space so that’s a lot of levels! Every time you connect to the Community moon, all your scores from the community levels are uploaded so you can still see how many people have played your level and what scores they got. We also have the full grief reporting system up and running like on the PS3, enabling us to keep everyone safe from naughty Nancy’s nasty devices. TVGB: Are you confident that the community can build up a library of portable levels that live up to the PS3 version? Laura Dilloway: Absolutely. The great thing about the PSP is that you can take it anywhere, so you can create levels on the go and at any time. You’re no longer tied to your sofa! Players who are already familiar with the PS3 game won’t have to relearn anything because our functionality is essentially the same, so they’ll be able to dive straight in and get creating. Even if you’re new to LBP, it’s so intuitive that you’ll be up and creating in no time! I think we’ll get some really interesting levels. TVGB: If a player has a great idea for a LBP level, but he has both PSP and PS3 versions, what would be the benefits of choosing to create the level on PSP? Laura Dilloway: The PSP gives players the opportunity to be much more spontaneously creative. You will be able to create in the car, on the train, in your lunchbreak… and if you see something that inspires you then you’ll instantly be able to start making it. You’ll be able to build up your levels every time you get a spare minute, instead of having to wait until you can get home and hog the TV and PS3. TVGB: Can an experienced LBP player just jump right into the game and creation? Do they have to go through a creation tutorial again? Laura Dilloway: We have included tutorials but they are very easy to skip if you don’t want to listen to them. They are implemented differently from the tutorials on the PS3, and appear as videos that play automatically rather than mini-levels that you have to complete in order to unlock certain tools. So if you quit the video once it starts playing, then you will still unlock the associated tool. If later on you suddenly realise that you’re not quite the creation genius you thought and haven’t a clue what you’re doing, then you can of course replay a tutorial again by using the Popit menu. TVGB: What about new players? Is a certain level of understanding of LBP recommended? Laura Dilloway: I think one of the great things about LBP is that it is so accessible to such a wide range of people. The PSP game could stand alone in its own right because we assume no prior knowledge of the game. The first theme in the game (Down Under) is equivalent to The Gardens theme on PS3, so we guide you through the basic principles whilst introducing you to some of the many wonderful things in the LBP universe. My Moon and Create mode are not unlocked until you have completed this theme, so by then even new players who have never entered the LBP world should have gained enough understanding to start putting together their own levels, if they so choose. Experienced players should be able to zoom through these early levels with no problems, allowing them to be up and creating in no time, along with the host of brand new stickers and materials that they have collected. TVGB: There’s still a single player to enjoy with around 30 exclusive levels. What have you done to make this a campaign worth playing through if LBP PS3 might have left you feeling like you’d seen it all? Laura Dilloway: Well, we’re an entirely different studio to the Media Molecule guys and whilst they’ve been extremely valuable consultants, at the end of the day we’ve made a completely new version of the game. Our level teams all played through the PS3 version before even starting on the PSP levels, so we knew what had been done before. We had a new storyline, with new themes, and this in turn presented us with lots of fresh ideas to work with. Our designers have come up with some great mechanics that hopefully people will love. We’ve even had players on our Beta trial joking that they’re going to steal our ideas and claim them as their own, which I take as a sign that we’ve done something well! TVGB: If you can fit all of the gameplay of LBP on PSP, do you believe more could have been done with the PS3 version? Laura Dilloway: The Media Molecule team did an incredible job when they came up with the whole concept of LBP, and in a sense we had the easier task as they had done all the groundwork for us. Saying that, it was still an immense challenge for us and it is a credit to the Cambridge team that people think we have been so successful. MM haven’t stopped though, the Paintinator in the MGS pack added a whole new level of gameplay and the new Water pack looks stunning – I can’t wait to see what possibilities that opens up. We’re definitely looking forward to seeing what they have planned next, no doubt it will be something that continues to push the PS3 and really test its limits. TVGB: Do you believe this is the closest the PSP is going to get to a full on home console experience? Laura Dilloway: Actually I think that the PSP can offer much more than a home console. After all, it is designed to be something portable, that you can carry with you at all times, and so you can play it wherever you are whether you are in or out of the house. The PSP also has such variety of games that you can have anything from a quick five minute blast at something, to an epic five hour epic session – creating an awesome LBP level for example! With the latest developments in PSP-PS3 connectivity, allowing you to access your PS3 system from anywhere in the world; coupled with the extra features that the PSP offers such as Skype and a portable internet connection, I already find the PSP ideal in many ways – and it’s still evolving. TVGB: Would you say that what you’ve done with just a PSP is more of a milestone than achieving what happened on PS3? Laura Dilloway: To say that would be to undermine the undeniably amazing achievements of the Media Molecule team. I think that what we have done is to convincingly show the world just how much the PSP is capable of, and perhaps to raise the bar for people’s expectations of games on a portable device. If that leads to the development of even more great games on the PSP then that can only be a good thing! TVGB: Are there any other PS3 franchises that you think could achieve similar success porting to PSP? Laura Dilloway: If you consider games such as God of War: Chains of Olympus, Killzone Liberation, Gran Turismo and the upcoming Metal Gear Solid: Peace Walker then I think you can begin to realise that pretty much any game can have an equally impressive game made for the PSP. Personally I’m interested in the new Assassins Creed: Bloodlines, and if it were up to me I think Uncharted ought to be next in line for the PSP treatment! TVGB: Does LBP being portable add another level to “Play Create Share”? Laura Dilloway: Well one of our official tag lines is: “Play Create Share – Everywhere”. I think that sums it up pretty nicely. So there you have it. We’d like to thank Laura for the time she’s dedicated to giving us detailed answers this week and at the Eurogamer Expo. 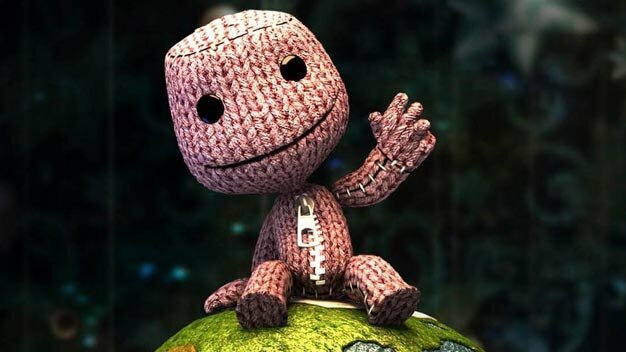 LittleBigPlanet makes a PSP debut this month.